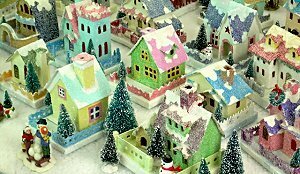 Note from Editor: This is another of our series of articles on building glitterhouses, replicas of those cardboard houses that became popular Christmas decorations between World Wars. These projects come to us courtesy of Florida designer Howard Lamey. 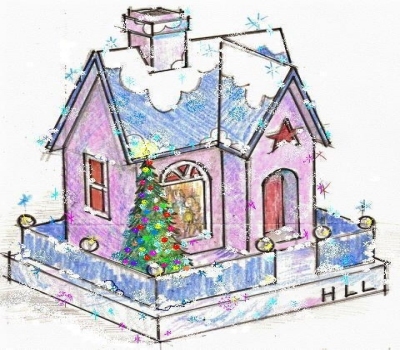 Howard loves collecting and designing glitter houses, or as collectors call them, "putz" houses, from a German-American word related to "putter." Vintage meets vintage! 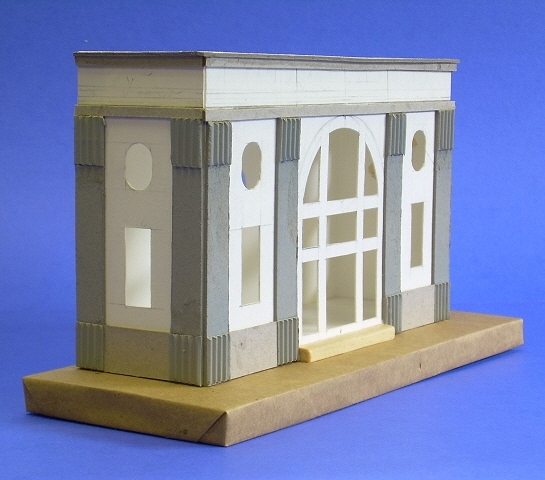 For this project, Howard found his inspiration, not in Japanese putz house designs, but in the big-city station that Lionel has been modeling in one form or another for nearly a century. This may not be as strange as it seems, as a number of the cardboard houses made during the putz house era were intended to look as good with Lionel trains as they did around the tree. A "Union Station" was a train station served by more than one railroad, so generally it was the biggest railroad station in the city. This project pays homage to the spirit of those "big-city" stations without making a structure so large it takes over (unless you want to blow up the plans and make it bigger). There are several differences between this project and the starter project, including the textured finish using sand. However, if you've built that project, or the Picture Window House, you shouldn't have any problems with this one. Cardboard that is "corrugated" on one side only (for the "fluted" pillars). I used coffee-cup holders from a coffee shop. "Vellum" or other transparent or translucent medium for printing the door and window pattern (this is optional; the building in the photos shows windows printed on acid-free paper. Several spring-type clothes pins to hold things together as the glue dries. PDF File for Union Station Plan 1 - Note, this is not to scale; it is a guidline only. PDF File for Union Station To Scale - This plan shows only the station front and sides and the column. It is to scale. To see the whole plan, print on legal paper, without print scaling or "fit to print" option. If you don't have legal paper, it will print the main wall on most printers, and that is enough to go by in a pinch. Rember NOT to use print scaling or "fit to print." 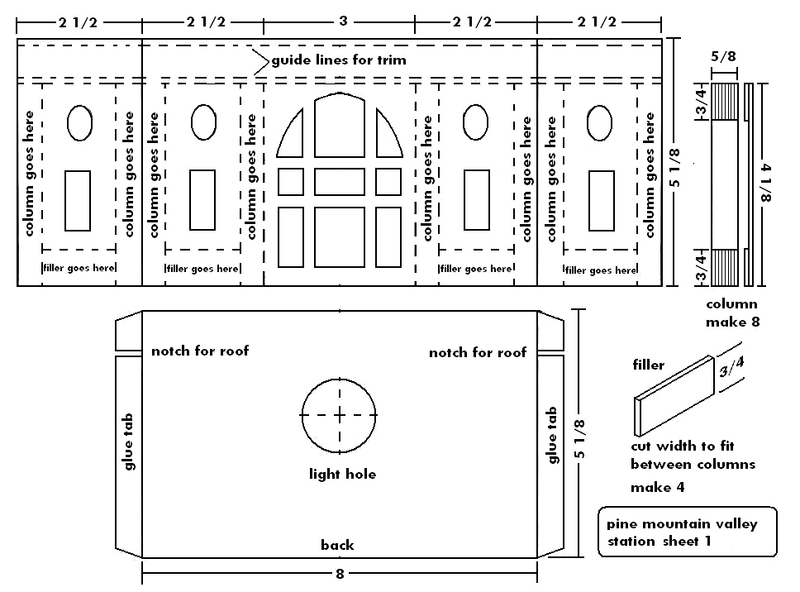 PDF File for Union Station Plan 2 - Not to scale; it is an instruction sheet only. PDF File for Union Station Plan 3 - Not to scale; it is an instruction sheet only. 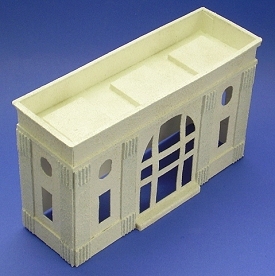 Union Station Windows - This file will print at the same size as thePDF File for Union Station To Scale1, so if you use that template, these windows should fit right in. If you have vellum or some other translucent or semitranslucent medum, use that. Whatever you use, print at the highest "quality" setting you can to saturate the color. Select the print option, tell it to "auto rotate and center" or whatever else you need to make it go to Landscape mode. Don't select the "scale to page" or "shrink to fit" option. Print. 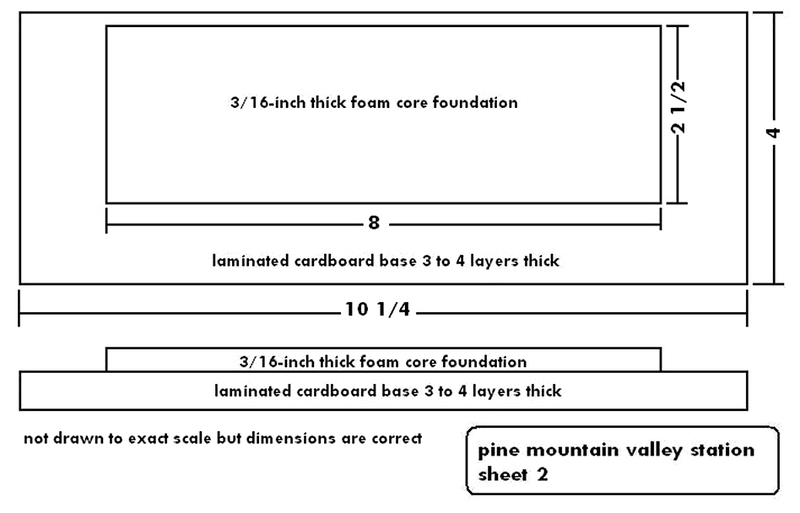 When you get your printout, double-check the measurements with a ruler. For example, the front wall should be 8" wide and 5 1/8" high. Note: On some printers, a small portion of the image will disappear at the outside edge of the page. But you can easily "fill in the details" by looking at the jpg versions. If you don't have Adobe Acrobat Reader on your computer or for some reason that doesn't work, you can open the big JPG versions by clicking on the reduced plans above. Choose the "file, page setup" from your browser. When the page setup menu comes up, select "landscape mode." Choose the "scale to fit" option (sometimes "print as large as possible" or something like that. You may have to tweak the sizes to get them just right, though - that's why the PDF versions are more likely to work for you. The base is a rectangular "box" that is decorated before the station is installed. For this project, it should be about 10.5" x 4" and about 1/2" high. 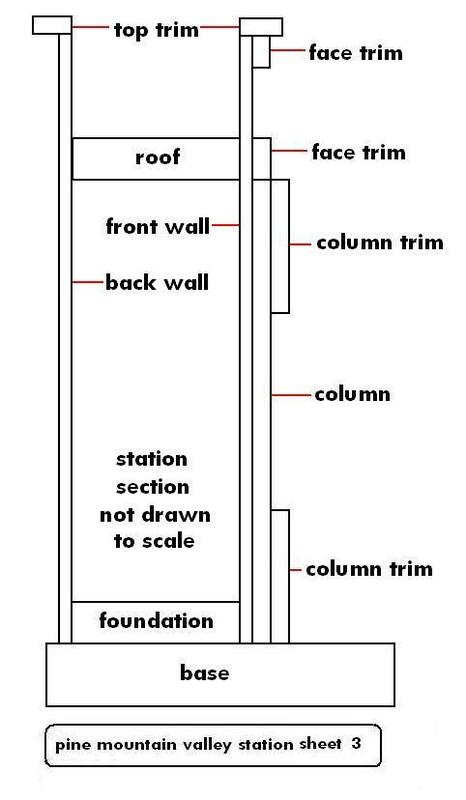 The foundation is simpy a rectangle that helps the building stay in place after everything is glued together. The roof is another rectangle of the same size. 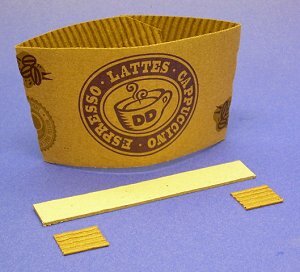 Cut and Build Up The Base - Build the base up from layers of corrugated cardboard glued together in a sandwich. You then wrap and glue a strip of thin poster-board or cereal-box cardboard all around it to smooth over the rough edges of the corrugated cardboard. Cut the Foundation and Roof - I used some scraps of foam core board, but you could use stiff corrugated cardboard as well, since the edges won't show. 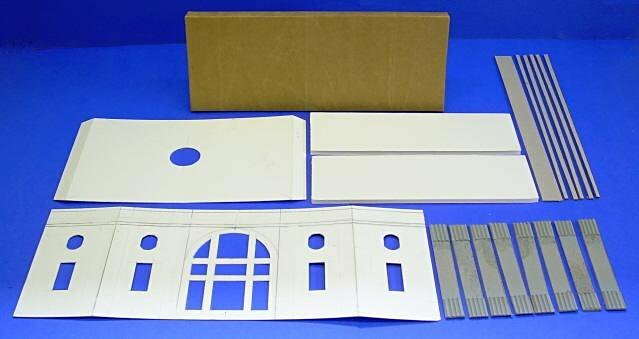 Carefully transfer the patterns of all pieces to the cardboard building stock. A .05 mm lead mechanical pencil and a “C-Through” brand ruler make this accurate and easy. 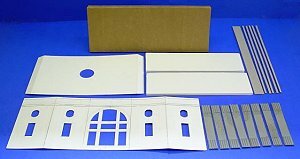 Score the fold lines before you begin cutting out the main station parts. 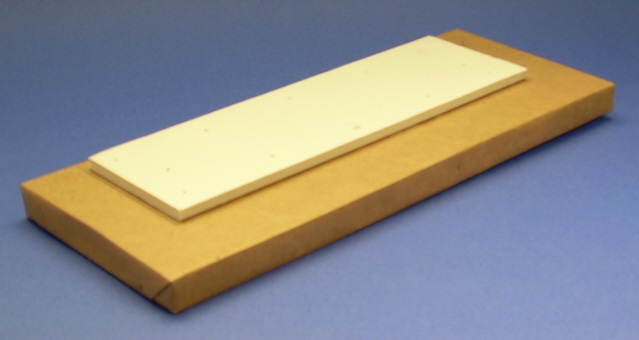 Use the metal ruler or other steel edge as a guide. White glue works best if you apply a thin coat to each mating surface and wait a few moments for the glue to become tacky. Do not glue the building to the base until the instructions say to. You CAN check the fit as you progress by setting it on the foundation, if you wish. Fold the station walls where you have scored them and glue the tabs that hold them together. Wrap the walls around the roof piece to check your fit. 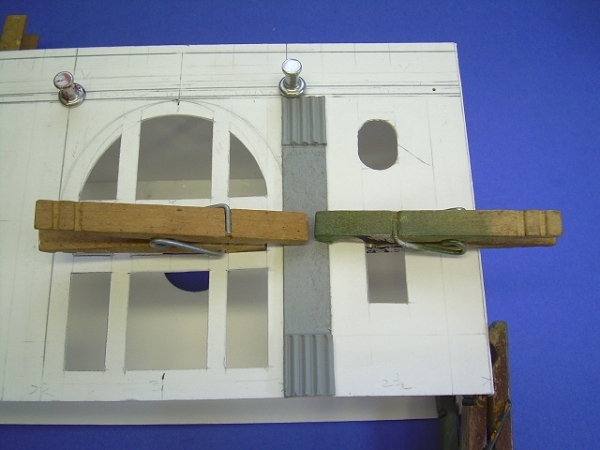 The photo to the right shows the station walls being held together with clothes pins as the glue that holds them together dries. The push-pins are being used to hold the ceiling in place as the glue for roof dries. If you use corrugated cardboard instead of foam core for the roof, you may find it handy to wrap the building in a rubber band or two to help keep pressure on the roof as it dries. Be sure to check it every so often in case something has slipped out of place. While the building is drying, glue the columns together. Note: If I make another one of these I will either find thicker cardboard for the columns or else double up the long piece, to provide more depth. After the building is dry, you may check the fit on the foundation and base if you'd like, but don't glue it down yet. Then begin gluing the columns to the building. Again, your clothes pins will come in handy. Glue the rest of the trim on and add the roof hatches. 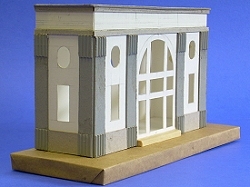 In this photo, the building has been set on the base to check the fit and the overall look, but it is not glued down until later. You can see the placement of the roof hatches in the photo of the painted building below. After the primer is very dry (such as overnight), make a small batch of a 50/50 paint in the color you've chosen and Elmer's white glue. Working on only one surface at a time, brush the glue/paint mixture on, then sprinkle sand on it before the mixture starts to film over. Depending on how you want to do the sign or lettering on your building, you may want to avoid putting sand on the area where the building name will go. If you have an area isn't covered evenly, touch it up with straight glue and more sand, and let THAT dry. Paint the trim in your choice of colors. I painted the trim with red acrylic paint and painted the top of the hatches with green acrylic paint. Don't glue the structure to the base yet, though. Provide your station name. 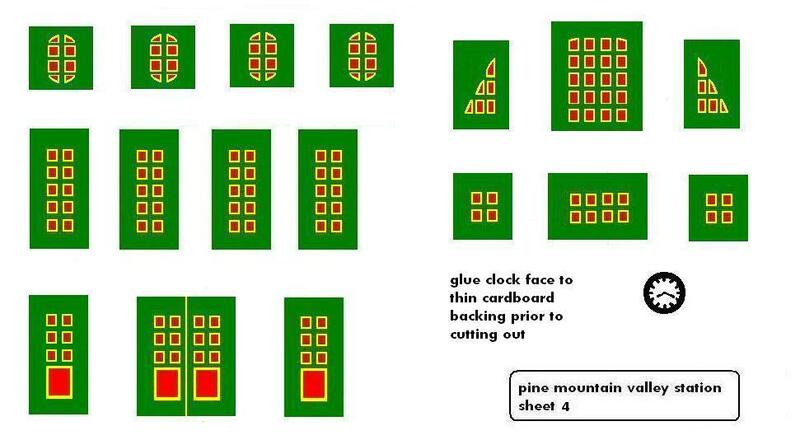 Pine Mountain Valley is the name of my Christmas village, so you should use the name of yours. I had the words cut out of adhesive-backed green vinyl by a local sign shop for a few dollars. After I put the letters on, I applied several coats of Krylon matte finish clear spray to help the letters adhere to the surface. You can paint the name on, or use one of the graphics that Paul has provided by clicking on the illustration to the right. Paint the base. In the photo above, you'll notice that I painted the base gray, then used a straightedge and drafting pen to draw "expansion" lines in the "concrete." 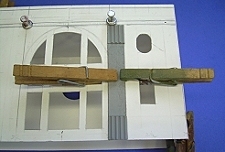 Cut out the windows and clock and glue them in place from the inside. Paste the clock on cardboard. Use a marker to blacken the edge of the cardboard. 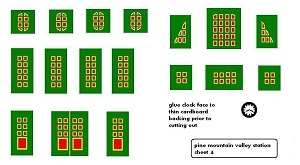 Glue the clock onto the building. When you're completely satisfied with how things have gone together, glue the building to the foundation/bass assembly. If you want to add touches of frost, like we have in the photo to your right, you may. 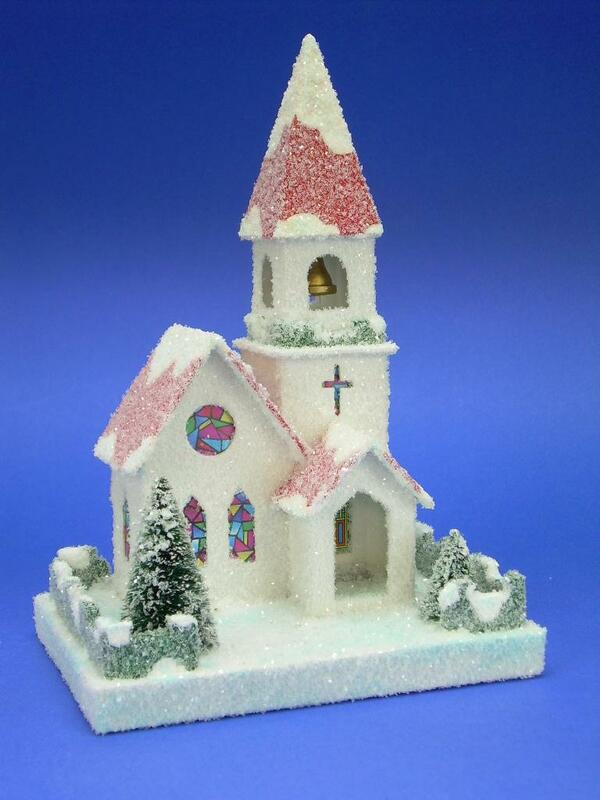 Brush on a thin, but even coat of undiluted white glue over where you want the frost to "appear" on the building and sprinkle on the clear glitter. Don’t try to do the entire building or base at once. White glue starts to film over and dry quickly so just do a section at a time. The glue dries clear, so don’t judge the final look until the glue is dry. Also, if you want a water tower to go along with your station, the Spook Hill water tower is easy to build and can easily be produced in Christmas colors (instead of Halloween). 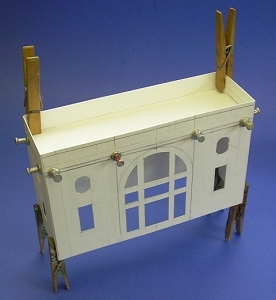 Perhaps you had a pasteboard house collection when you were young and would like to have a replica made. Or you have an idea for something that's never been done. If you can find a photo or hash out a drawing or anything else to give me some idea of what you're looking for, that can be enough to get started. "Papa Ted's Place" Ted Althof's extensive resource about vintage pasteboard houses. Includes some history, many photos from other people's collections, and resources to help you build your own. The links below will take you right to the appropriate page on "Papa" Ted's site. You'll find lots of other pages to look at while you're there, though.